Studio East does not shy away from the challenging, unconventional or the controversial. On October 5, Studio East opened a limited run of Celeste Raspanti’s play “I Never Saw Another Butterfly” which wrapped up on Oct 13. 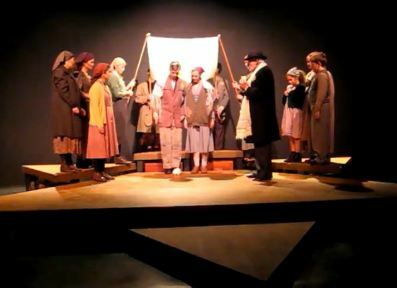 “Butterfly” tells the heartrending story of 15,000 Jewish children who passed through the Terezin concentration camp during World War II most on their way to Auschwitz. Their story is told through Raja, one of only a hundred children who survived Terezin, and pieced together from the poems and artwork which the children of Terezin left behind as their legacy. It is a haunting tale made more visceral as Studio East tells it using young people and children. There are two different casts performing during this production and I was attending a production performed by Cast A. The task of attempting to convey the horrors and inhumanities inflicted upon Jews during the Holocaust to audiences so far removed from these tragedies is a monumental assignment, perhaps made more challenging through the use of young people and children with limited life experiences to draw upon. As I mentioned, Studio East dares greatness and always swings for the fences which is admirable. While overall the play was extremely well done, engaging with many poignant moments where I was touched, some of performances felt a little flat or disconnected from the horror which was being portrayed on stage. 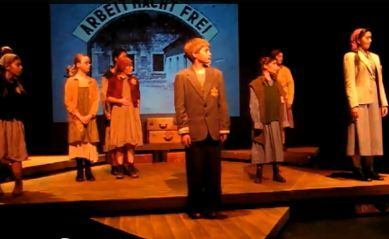 One of the most effective scenes designed to convey the loss of life, were the scenes where children at Terezin are systematically spotlighted and came alive to share their poem or reflection upon their time at Terezin. After allowing the audience to “know them” individually, they are rudely interrupted by the shrill train whistle followed by the reading of their names. Upon hearing their names called, each quietly exits the stage to board the train to Auschwitz leaving behind a stunned audience which is only too aware of their inevitable fate. A gaunt and sober older Raja, played with depth and seriousness by Kenzie Kovacs-Szabo, does an admirable job as our companion bearing witness to the events of the play. As her younger self, played by a precocious Frances Kowal, she is befriended at Terezin by the maternal Irena, played with warmth and charm by Xana Waughman. Irena has taken it upon herself to teach the children and hope against hope to help them to relish the joys of being a child as long as possible while they are at Terezin. There are many haunting moments during the performance, which lingered with me long after the play was over. One particular scene was of a young girl vividly describing consumption of the dirt crusted, green gruel that the children were forced to eat to appease their hunger pains. Another gripping moment came when the young version of Raja struggling to deal with the horror which awaits those that leave on the trains, finally breaks down yelling out her pain to Irena. She grabs the children’s artwork, ripping and scattering them about her feet, exclaiming “What’s the use, if we’re all going to die?” Of course the “Not Alone” scene at the end was well done and emotionally moving. Pavel and Irca’s Wedding. 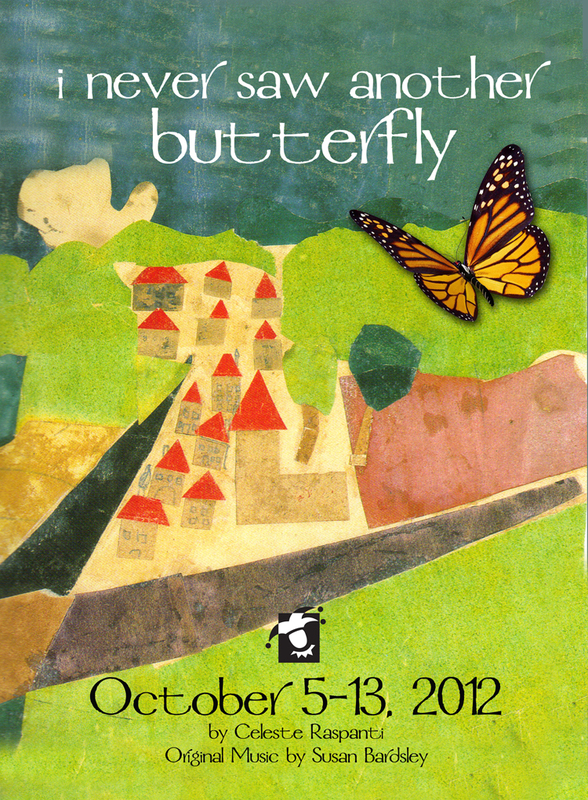 Studio East Production of “I Never Saw Another Butterfly“. In the eyes of children, we are undone by the horror, injustice and insanity of their situation. From their hell, Irena manages to preserve the notions of beauty and life in the art, songs and poetry she encourages the children to create with her; clinging to the ideal that there is a place where “no one kills another”. We see that even in the nightmarish world of Nazi controlled Terezin, confronted by the lowest depravity of man’s inhumanity to man, we find an oasis where beauty and love cannot be extinguished. We perceive it in the art and poetry of the children and the selfless loving devotion of their teacher Irena. We experience it in the love shining in the darkness of the holocaust, first in the committed love of Pavel and Irca, who are wedded at Terezin and later in the blossoming of first love between Raja and Honza. Though their oasis is each shaken by the stark reality of a shrilled train whistle calling them, they have not lost their humanity, nor abandoned the things of life which make it worth living. It was a wonderful thought-provoking performance and a reminder to us that life goes on even in the midst of our valley of sorrow. Love, faith and courage become the beacons of hope, seeing us through dark times. It is an important message which the world needs to be reminded of today. I am left with a paraphrase from the show, “One by one the trains came for us ’til there was no one left. Who will remember me?” The same is true for each one of us. What will your legacy be? For more information about Studio East, future productions and classes, check out: http://studio-east.org.